Most of us have worked on projects where we’ve got our eye on the finish line from day one. But, what if the finish line is 5 years away? You’d have to adopt some strategies to ensure things stay on track and everyone stays inspired or you might not make it to that finish line. My guest on this episode of the Brilliant You Podcast knows this all too well. Her projects are usually 5 years from start to finish and they involve multiple partners, creative teams, and individuals who need to be mentored into leaders. She has to do all of this in a male dominated industry. Katie Burch is the founder and lead architect at Plan North Architectural Company. Her designs have won awards and she’s highly regarded as a powerhouse business woman in Houston. She’s also an author and TEDx speaker. She discovered early on in her career that she needed to develop some strategies if she was going to succeed. In this episode, she shares some of these strategies which turn out to be pretty universal. For example, because her projects are creative in nature and they span a long period of time, she’s discovered that one of the most important things to do is develop a relationship with the client and team members right away. In our conversation, she describes how she sets expectations and how she keeps the lines of communication open. She also shares how she handles being a woman in a male dominated industry by letting go of the need to please everyone. Her trick is to find a champion to help move the project forward. Even if, as she shares in this episode, it’s in your nature to seek approval from everyone. Another amazing strategy she shares is how she helps the individuals on the team shine – and how she mentors the top performers to become leaders. Plus, as a bonus, she shares some amazing tips on how to share your brand story through the way you design your office space. And, how to telegraph that over social media so that your potential clients get a sense of your culture and process. Finally, Katie issues a heartfelt challenge that channels the power of gratitude to help you get through tough times. She says it’s helped her, and when you hear what it is, you’re going to want to stop what you’re doing and take on her challenge. There is so much packed into our conversation, I can’t wait for you to share it with you. So, if you want to discover strategies for building valuable, long-term business relationships, inspire creativity and growth in your team, create an office space that is both functional and telegraphs your brand story, all with an attitude of gratitude, press play now. 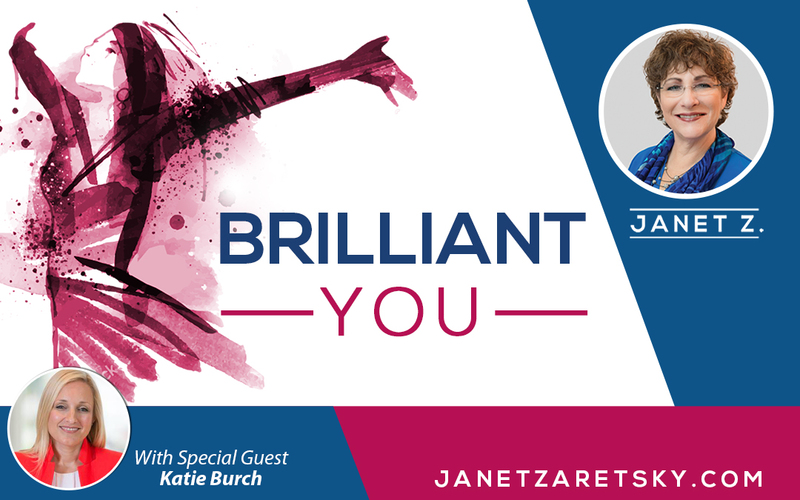 If you’re interested in her (free for Brilliant You Podcast listeners) Branding Your Business Workshop, email her at Katie@plannorth.com. If you haven’t already – make sure you download my Confidence Kit at: Confidentwithnoapology.com. Or email me to work with me or be on the show media@janetzaretsky.com.